HTC Desire 830 has been launched in Taiwan with a price tag of $310. Desire 830 is the successor of Desire 820, which was released back in 2015. There has been nice upgrades in this model but it is still be considered as mid range smartphone. Desire 830 comes with 3GB of RAM as compared to 2GB RAM in Desire 820, along with a fill HD display which is very bright and crisp. The phone is also loaded with boom sound that increases the music experience. Currently the phone is only available in red and blue color, though these colors are only used in side frames and camera ring, while rest of the phone is white in color. Along with Desire 830, HTC has also launched Desire 825, which has slightly low hardware specifications than 830. 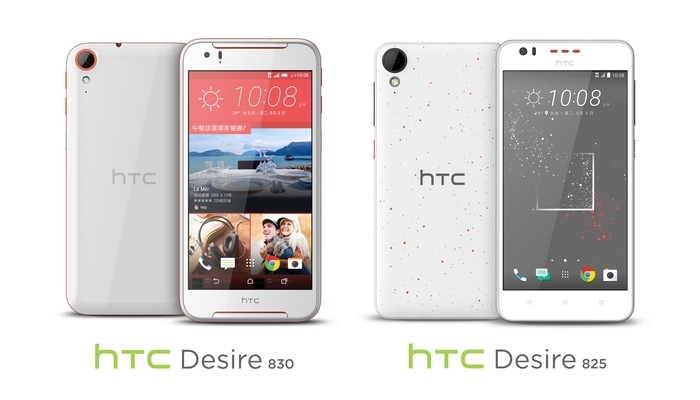 There has been no official news about the global availability of Desire 825 and 830, but we can expect these device soon in Asian countries. HTC Desire 830 is powered by MediaTek Helio X10 chipset with a 1.5GHz octa-core processor accompanied with 3GB of RAM. It has 32GB of internal storage with support for memory cards up to 128GB. The device is backed with 2800mAh battery which can delivery one day backup with moderate usage. Desire 830 comes with latest Android Marshmallow with Sense UI over the top. The phone sports a 13MP primary camera with Optical Image Stabilization and f/2.0 aperture. On the front, it holds a 4MP, f/2.0 UltraPixel camera for great selfies. The phone will be on sale from 6th May on wards at a price of NT $9,990 (310 USD), while Desire 825 will be sold for NT $7,990 (250 USD). To get more updates on upcoming HTC smartphones, stay tuned with us.